I was looking at buying a Shimotsuke Mai. I have also been considering the Tbum 36 and thought it might be a viable rival to the Shimotsuke. I like Suntech rods and I have a Kurenai that has done what I've asked of it and has even caught bigger fish than what it's designed for. The only thing that worried me about the Tbum 36 was the foam handle. I decided to take a chance and bought the Tbum 36. I was very glad I did. It truly is designed well and can do it all just as Tom Davis of Teton Tenkara stated in his review of it. I see this rod going on many fishing trips with me in the future. The fit and finish are top notch. Another glowing report. Sooner or later I'll have to give one a try. I just spent the weekend fishing three different southern Missouri spring creeks. I caught trout everyday and every trout was caught on the Tbum 36, usually with a bead head UKB. It's become my go to set up. If you were anywhere where I was fishing for wild rainbows, the only thing I could get them to take was a beadhead. Usually a natural pheasant tail or a black one. Black was big this weekend. 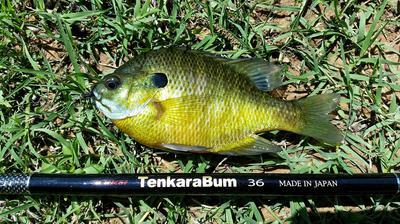 The TenkaraBum 36 has become my "go to" 12' rod. I like it!